Ottoville’s Zane Martin guards Temple Christian’s Brody Bowman during Friday night’s game at Ottoville High School. OTTOVILLE – Temple Christian did a good job of negating its size disadvantage for nearly three quarters in Friday’s boys’ basketball matchup at Ottoville. 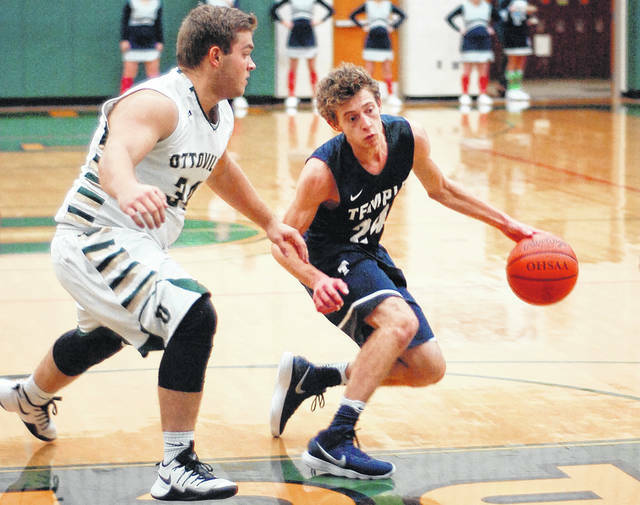 After a nip-and tuck first half in which Ottoville slipped out with a 2-point halftime advantage, the Big Green then took it over later in the third quarter and pulled away for a convincing 75-52 victory over Temple Christian. Ottoville (1-0) had three players score in double figures. Logan Kemper led the way with 25 points, including 14 fourth-quarter points. Nick Moorman poured in 22 points, including 17 third-quarter points. Josh Thorbahn scored 16 points for the Big Green. Brody Bowman led Temple (0-1) with 21 points, including 9-of-10 shooting from the free throw line. Bowman also made five steals and dished out five assists. Teammate Noah Howell scored 20 points, including six shots behind the arc. The score was knotted four times and the lead changed hands twice in the first eight minutes of action as Temple Christian came away with an 18-14 lead at the first stop. Ottoville reclaimed the lead, 25-23, at the 3:40 mark of the second quarter, on an inside move by Kemper. Thorbahn led the Big Green with nine second-quarter points. Ottoville slipped out with a 32-30 lead by the break. Early in the third quarter, the teams exchanged baskets. Howell kept the Pioneers in the hunt with his outside shooting, hitting two 3-pointers in the third quarter. Moorman led the Big Green, scoring 17 points in the quarter, including a shot beyond half court at the buzzer, giving his team a 53-44 lead. The Big Green stretched their lead to 57-46, just a minute into the fourth stanza, on an inside move by Kemper. At the 4:03 mark, Kemper scored off a fast break and was fouled. Kemper completed the 3-point play to give Ottoville a 65-48 lead. A little later, Ottoville extended its lead to 71-50 on a 3-pointer by Kemper. Then moments later, the Big Green got it going in transition again as Ryan Bendele made a steal and led Kemper, who raced to the basket, giving Ottoville a commanding 73-50 lead, with less than two minutes to play. Ottoville won the battle on the boards, 47-29. Ottoville shot 43 percent from the floor, while Temple connected on 34 percent of its field goal attempts. “First of all, I’m proud of our kids,” Temple Christian coach Bruce Bowman said. “We fought hard tonight. We had a lead most of the first half, and they took it away from us on the last possession of the first half. The Lima News sports department can be reached at 567-242-0451.